A judge on Wednesday sentenced four men to life in prison for attempting to bomb London's transit system on July 21, 2005, two weeks after suicide bombers killed 52 commuters in the city. Earlier in the day, prosecutors ordered the other two men charged in the case to face retrial over the failed plot. Judge Adrian Fulford said the four men already convicted must spend at least 40 years in jail before becoming eligible for parole. A jury on Monday found Muktar Said Ibrahim, 29; Yassin Omar, 26; Ramzi Mohammed, 25; and Hussain Osman, 28, guilty of conspiracy to murder in an al Qaeda-inspired plot to detonate explosives-filled knapsacks on three subway trains and a bus. A statement released by the Crown Prosecution Service said: "While the implementation of their claim was incompetent, their aim was clear. They wanted to kill and maim on a massive scale." Crown Prosecutor Nigel Sweeney told a London court that Manfo Kwaku Asiedu, 34, and Adel Yahya, 24, must be retried after the jury in their first trial failed to reach verdicts on them. Prosecutors said the planned attacks were a deliberate mirror image of the July 7 transit bombings. Judge Adrian Fulford dismissed the jury on Tuesday after they said they could not agree on a verdict for the two co-accused. Britain's new prime minister, Gordon Brown, said Wednesday that policy in Iraq and Afghanistan had no impact on the threat to Britain from terrorism — despite three recent failed bombings in London and Scotland. Britain would be at risk "whatever was happening in Afghanistan or Iraq," Brown said. Brown said no country could be "secure in a situation where you have a set of terrorist groups, loosely linked as al Qaeda, that are determined to practice carnage across the world." Al Qaeda linked terrorists "have struck in many, many countries, have organizations and cells operating right across Europe and in other countries including, of course, Africa as well as in America," Brown said. All six defendants in the July 21, 2005 case denied the charges against them, saying the devices were duds and their actions a protest against the Iraq war. But police and prosecutors said scientific tests proved the bombs were all viable. They do not know why they did not work. During the six-month trial, prosecutors say Asiedu lost his nerve and abandoned his device in a London park. Yahya left Britain for Ethiopia several weeks before the attacks. The four attempted to detonate explosives-laden backpacks on three subway trains and a bus, as in the July 7, 2005, attacks. The devices — made from a volatile mix of hydrogen peroxide and flour — failed to explode, and no one was injured. The explosives were packed in plastic tubs, with screws, bolts and other pieces of metal taped to the outside as shrapnel. The detonators contained triacetone triperoxide (TATP), an explosive used by the July 7 bombers. Omar and Mohammed set off their devices aboard two subway trains; a couple of hours later Ibrahim's device failed aboard a double-decker bus. 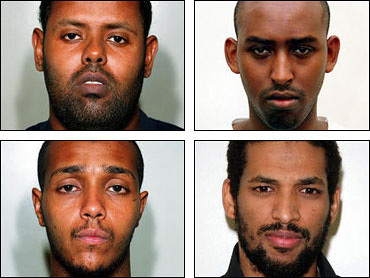 Unlike three of the four July 7 bombers, who were British-born, those in the July 21 plot had come to Britain as young men from places like Eritrea, Ethiopia and Somalia. Some had become British citizens, while others had refugee status.